My neighborhood is in glorious full bloom; here's one of my favorite flowers just doing what it does best. This is a perfect Bella flower...just says YOU all over it! Have a wonderful weekend, Bella! Beeeeaaaaautiful. You know, sadly I've never seen a poppy growing in real life :(. Have a fabulous weekend Bella!! Hi Beautiful Bella!! That gorgeous crimson flower is perfect!!! I can see you wearing it a la Frida Kahlo. poppies & weekend!, wonderful mix and wish you enjoy it! Wow I love that hit of red! Poppys are the ultimate summer flower. *Oh* *sigh* I've tried planting poppies twice in my life, once as a teen in mid-Michigan, and once last year in northern Wisconsin. No joy, although many other peoples' early summer gardens sport them abundantly even here in Zone 5! 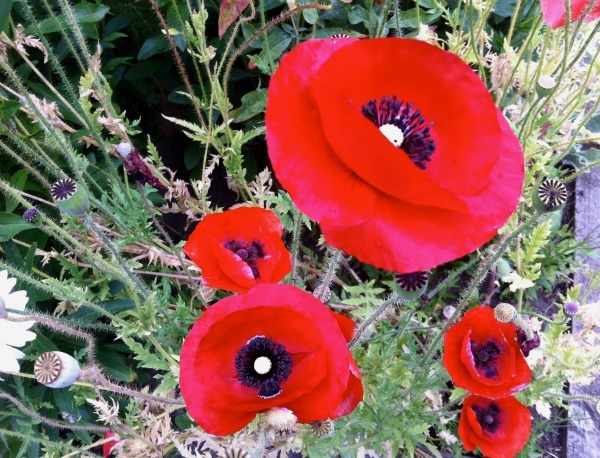 I love the tissuey, translucent vibrancy of poppies.